The Bear's Paw quilt block is an old favourite. This is despite its unusual size due to the fact that it is a seven patch block. However, this quilt block is a wonderful choice, especially if you wish to make larger quilt blocks for your finished quilt. This Bear's Paw is built on a 7 x 7 grid, but rest assured that this does not mean that you have to construct 49 patches. 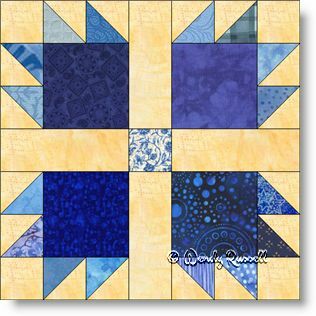 Simple rectangles, squares and half square triangles are all the components in this quilt block. The two sample quilts illustrated, show the quilt blocks laid out on point in each case. However, note the difference between the two quilts by simply using your imagination.